For now at least, the moon is like the sea: everyone can use it, but no one can own it. In 1967 the U.S. and the Soviet Union negotiated the Outer Space Treaty, which states that no nation can own a piece of the moon or an asteroid. "You have a right to go up and take the lunar soil, but you don't have any right to draw a square on the surface of the moon and say, 'That square is mine,'" says Stephen E. Doyle, a retired lawyer who served as NASA's Deputy Director of Internal Affairs. If the Space Settlement Institute-which lobbies for private industry to develop land on other planets-has its way, new laws will allow space colonists to stake moon claims and start a colony. Alan Wasser, the Space Settlement Institute's chairman, says that a private company should build a "spaceline," similar to an airline, between the Earth and moon. And because a corporation is not a nation, the Outer Space Treaty would not apply. Corporations have settled new worlds before. The London Company was a joint stock enterprise that established the Jamestown Settlement in 1607,providing transportation to pioneers in return for seven years of labor in America, where they cultivated tobacco and other crops for the company's profit. Wasser says that land ownership-and the promise of profits based on it-is a necessary incentive to invest in space settlement. He is lobbying for legislation that would commit the U.S. government to honor future moon claims. But anyone can buy a deed to land on the moon right now. 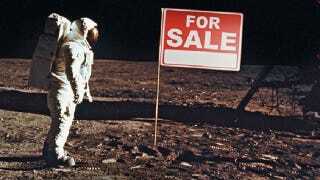 The Lunar Registry ("Earth's leading lunar real-estate agency") sells such deeds on its website for about $20 an acre. Doyle says that some kind of lunar governing body is necessary to recognize and enforce property rights, but no such body exists. So as it stands, the claims are not much more than fancy pieces of paper. Doyle says that future moon settlers could look to the Antarctic Treaty, which designates the continent as a scientific preserve and prohibits military activity or mining; 28 countries maintain research stations subject to review by the Council of Managers of National Antarctic Programs, which oversees best practices of scientific research on the continent. "Anybody who understands the implications of imposing a national law on celestial bodies," Doyle says, "understands we are better to treat it like Antarctica and the high seas than we are to treat it like Manhattan." If not, he says, we would "take all the problems and contests we've had on the surface of the Earth for 5,000 years and extend them to outer space."